Players start at one end of the grid. 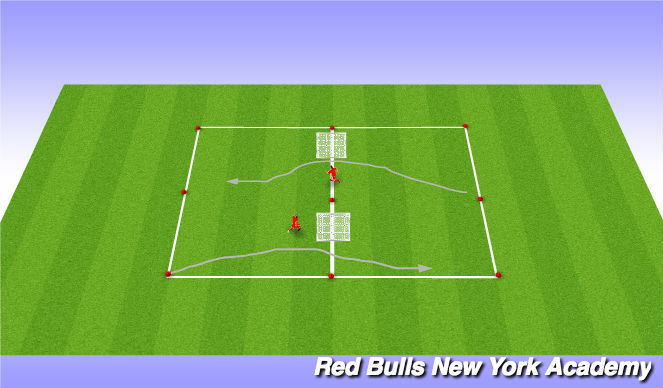 Using smaller touches player dribble to the center two cones and prefrom their move before dribbling down to the opposite cone on that side. Once all players have gone they repeat the same sequence back using the oppposite foot. -Open your hips up as if to suggest a pass before swinging them around carrying the ball forward. Players start at one end of the grid. Using messi touches player dribble to the center two cones and prefrom their move before dribbling down to the opposite cone on that side. Once all players have gone they repeat the same sequence back using the oppposite foot. Open your hips up as if to suggest a pass before swinging them around carrying the ball forward. Organization: 5 players per grid as shown, 2 pugg goals. one soccer ball. Player a passes to player b. Player b passes to player c. Player c and player d now go 2v1 to the opposite endline for a point. 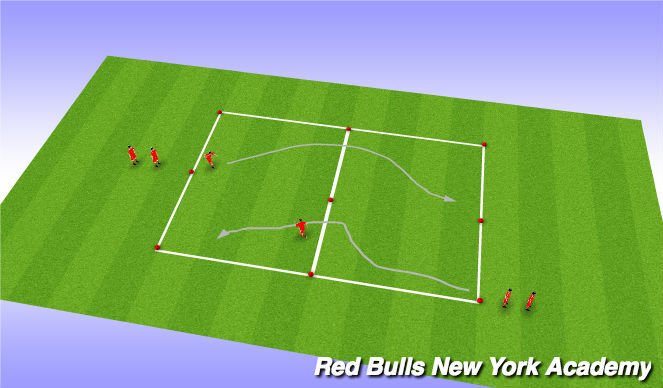 if defender wins the ball they look to dribble across the opposite endline for a point. Players on offense recieve1 point for dribbling normally over the endline. 2 points if they are able to use a wall pass to get over the endline. 3 points if they are able to do the hip swivel and get over the endline.